When it comes to birth and parenthood, everyone has their own unique story. Everyone's experience is going to be different. And all babies are different. We prepared as much as we could before our baby was born. We read the books, took the classes, were surrounded by amazing friends and family who passed down valuable advice -- but in retrospect, there was nothing that we, or anyone can do to truly prepare for the real thing. While I was pregnant, I only (selectively) heard the good things. I only heard how amazing it was going to be, and what a good mom I would be, and how I would love being a mom. I didn't focus on or really understand the magnitude of the challenges that were to come. I totally understand that people don't want to spread negativity and also that many first-time moms don't want to hear it. But for me, I wish I had. Hearing the negative along with the positive would have set my expectations allowing me to be more prepared for both the good and challenging times ahead. That said, here is a list of five things that no one told me (or I selectively didn't hear), that I wish I would've known before our baby was born. As someone who does not believe that cow's milk is ideal for healthy human consumption, this is hard for me to say. But for you mamas-to-be that intend to breastfeed; indulge in those cupcakes, pancakes with lots of butter and all the cheese your heart desires now before you give birth. Approximately 15% of babies under 12 months have a dairy sensitivity (to varying degrees) which causes them to spit up, have excess gas, can cause blood in their stool and acid reflux...all the things that lead to a fussy baby. If your baby falls into this 15%, you'll want to give up dairy and possibly soy too for as long as you are breastfeeding or until the sensitivity resolves itself. 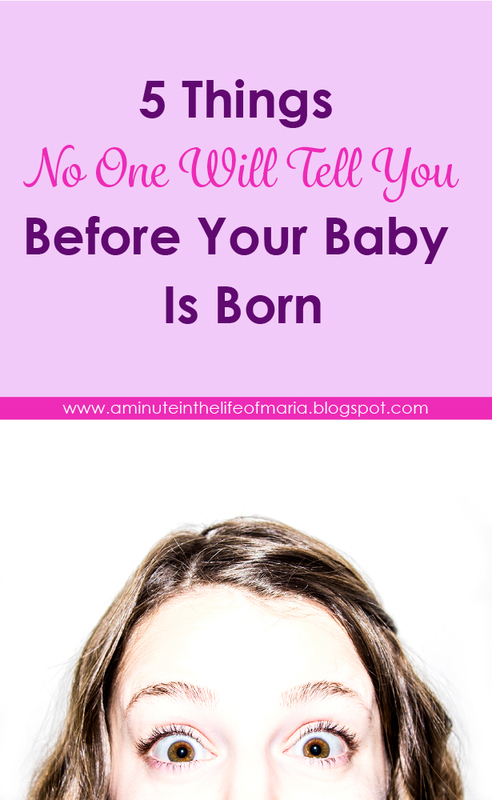 Yes, everyone tells you this before the baby is born. But what no one told me is that some babies, like mine, DO. NOT. NAP. This means you do not nap. Endless days and nights of nursing, burping, diaper changing and fruitless efforts of trying to get baby down to sleep could be yours. Even with my husband's round-the-clock support (he even took seven weeks off of work!) we were both beyond exhausted. This is another one of those instances where if I would have just known that this was a possibility, I wouldn't have been so blind-sided. Currently at seven months, our son is just now starting to take hour long naps, though the majority of his naps are only 30-45 minutes long, usually only twice a day. All over Instagram and Facebook I'd see images of moms with their hair and makeup done, looking amazing, out with their brand new babies. I assumed that would be me. There I was two months in and could barely get the baby into a stroller and on a walk around the neighborhood by myself. Pregnancy and birth are hard on your body and it takes awhile to recover. Then you have to get used to getting a baby ready to take out which includes strategically feeding them, dressing them, dressing yourself and actually getting out the door without a meltdown from either you or your baby. In my opinion, any outing during the first two months is something to feel very proud of. From breastfeeding, to sleepless days and nights to keeping that little blob alive, to the floods of hormones exiting your body, being a first-time mom is hard. Physically your body underwent a very dramatic transformation and is now recovering but for the first couple of months you are still in pain. You are learning how to care for a thankless blob who just cries, poops and wants to nurse all the time (which also really hurts in the beginning). Emotionally you are all over the map: happy, scared, excited, anxious and feeling all kinds of expectations. And on top of all of that you still need to eat, take a shower and brush your teeth. I don't miss those first two months. Not. at. all. The baby blues affect 80% of women who give birth while it's estimated that 1 in 7 women who give birth develop postpartum depression. More detailed information on both can be found here on the National Institute of Mental Health's website. In addition to all the things happening to you listed above, you may also feel isolated and extremely overwhelmed. Whether you don't have any other mom friends who understand what you're going through (because really, there is no way to understand it until you go through it) or if the last thing you want is for anyone to see you in your state of disarray, you may feel alone, overwhelmed and helpless. Especially when all you've been is excited for this new little baby, and when he or she arrives you are so out of sorts that you don't even know who you are anymore. And that's ok. It's normal. But you don't know it's normal if no one tells you. If you are that girl, know that it gets better and that you are not alone. Talk to someone whether its a family member, a friend or a doctor. Talking about it makes it worlds easier to get through. If you are a first-time expecting mama, buckle up, it's going to be a wild ride. At seven months in, I can now say that I would go through it all again in a heartbeat. It's all so worth it and that little blob starts to turn into the amazing baby you always wished for around three months, this comes directly from our pediatricians mouth and I concur. Looking back, I now see those initial months as some kind of Navy SEAL-type training/initiation/metamorphosis/rebirth period where when you get through it, you emerge a stronger, more compassionate, more mature, more confident and refined version of your formal self. It's kind of amazing. Great article. Glad to have those days behind me- but so accurate!